The Institute was founded by the Order of the Rector dated May 15, 2012 No 448 on the ground of the Decree of the University Academic Council dated April 26, 2012. The Institute is a constituent part of the University and together with the University it operates as a single Education and Research Complex SHEE "Vadym Hetman Kyiv National Economic University". 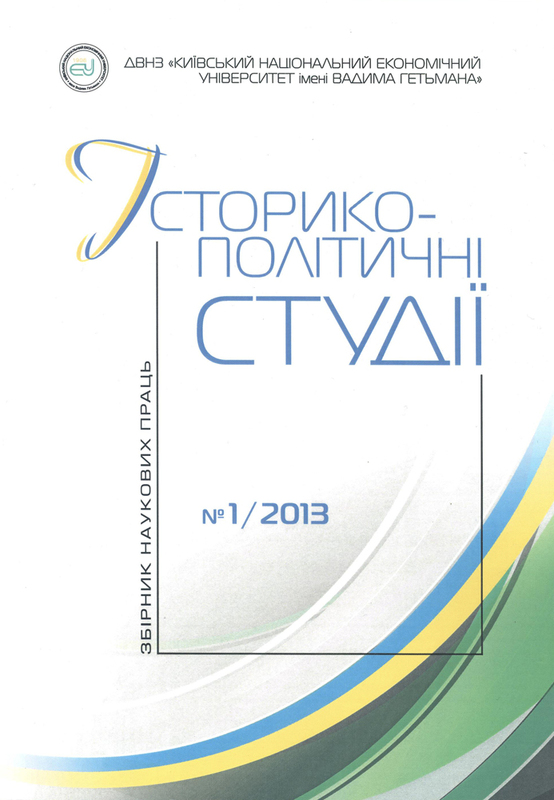 In its activities the Institute is guided by the current legislation, in particular the Laws of Ukraine "On Education ", "On Higher Education", "On scientific and technical activity ", "On priority directions of innovative activity in Ukraine ", other legal acts, Statutes of the University, the Internal Regulations of the University, the Orders of the Rector, decisions of the administration and the University Academic Council, and this Charter. The purpose of the Institute is to conduct basic and applied scientific research devoted to the problems of the history of the Ukrainian society as a part of European and world cultural space, scientific research and implementation of research and educational work in the direction of formation, historical development and contemporary social, economic, political, ethnic and cultural problems of the Ukrainian society. 1. Implementation of fundamental and applied research concerning genesis, formation tendencies of the Ukrainian society, social and economic, political, ethnic and national characteristics of its functioning as a part of foreign states, the USSR and in the flow of contemporary independent development, together with national Academies of Sciences and other research institutions. 2. Participation in the preparation of legislative acts of Ukraine related to the formation and implementation of social, ethnic and national, domestic and foreign policy in accordance with the historical traditions and contemporary needs of the Ukrainian society. 3. Conducting comprehensive research on social relations of the society on the territory of Ukraine at the stage of the ancient world and during the Middle Ages. 4. A comprehensive scientific study of the problems and peculiarities of social, economic, research and educational processes on the territory of Ukrainian lands during the period of formation and development of industrial society. 5. The study of the political, social, economic, ethnic, religious, and cultural development of the Ukrainian society during the twentieth century. 6. Analysis of the current state and prospects of political system development of the independent Ukraine. 7. The study of ethnic, religious and nation-forming processes in Ukraine during 1990 - 2010s. 8. Conducting comprehensive fundamental and applied research on foreign and security policy of Ukraine under conditions of non-stationary system of international relations at the beginning of XXI century. 9. Assessment of the nature and prospects of development and consequences of modern integration policy implication in Ukraine. 1. Coordination and cooperation with other organizations in Ukraine and abroad, to address the complex issues relating to the social and political development of Ukraine, its place in the history and contemporary processes of European civilization. 2. Conducting research and development in cooperation with other institutions both in Ukraine and abroad on the basis of contracts. 3. Providing scientific and practical advice and other assistance to central, regional and local governments, institutions, agencies and organizations and other legal entities and individuals on the history and political development of modern Ukrainian society. 4. Maintain supervision over the use of scientific developments of the Institute. 5. Organizing and conducting research, scientific and educational seminars, meetings, conferences, symposia, round tables, including international ones, in the areas of their activities. 6. Development of scientific schools, which study the history of the Ukrainian society, world history, history of international relations. 7. Implementation of the reciprocal exchange of scientists and experts between scientific and other organizations and institutions in Ukraine and abroad, organization of business trips for the staff abroad and receiving foreign experts. 8. Making preparations for the publication of collective and individual monographs, manuals, teaching aids, and other scientific publications. 9. Carrying out scientific evaluations of information and consultancy work. 10. Implementation of development and examination of laws and regulations, prepared by legislative and executive authorities of Ukraine. 11. Implementation of other scientific and organizational measures necessary to achieve the objective set by this Regulation. 1. Promote the deepening of relationship between scientific activity and the educational process through active use of political history and scientific research during the lectures and consulting activity. 2. Ensuring the participation of students and applicants for academic degrees in research work carried out in the Institute under the guidance of the staff of the Institute. 3. Creation of conditions to attract talented young people to science, particularly to ensure the participation of students in the academic circles on the history of the Ukrainian society, the Annual Students’ Conference. Organization and conducting massive research activities for students (conferences, seminars, round tables, contests, tournaments, etc.). Creating teaching tools to meet the cognitive interests and preferences of the students and implementation of domestic and foreign innovations and new technologies into educational process. 4. Participation in the development of training programs for new academic disciplines, improvement of the existing ones, including distance learning. 5. Harnessing the power of the scientific institutes of the National Academy of Sciences of Ukraine for joint training, extension, research and creation of training centers, joint research units and laboratories. 6. Participation in the training of students, young scientists, researchers and teaching staff of SHEE "Vadym Hetman Kyiv National Economic University" at leading universities and research centers, including overseas. 7. Carrying out of other scientific and educational activities towards achieving the objectives of the Institute within the current legislation of Ukraine.